Shibori is the Japanese word for a variety of ways of embellishing textiles by shaping cloth and securing it before dyeing. 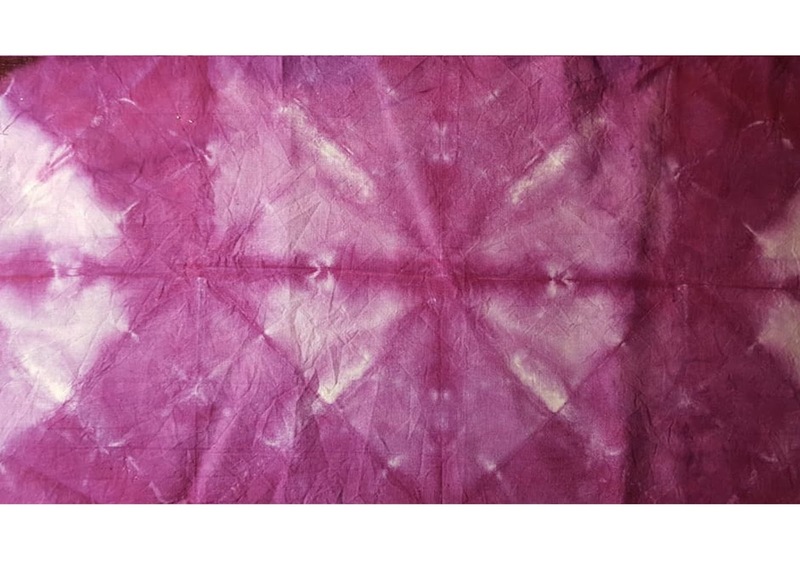 It is a process of manipulating fabric either by tying, folding, scrunching, wrapping, pleating which provides areas of resist where the dye cannot always reach, creating wonderful patterns sometimes with the most surprising outcomes. 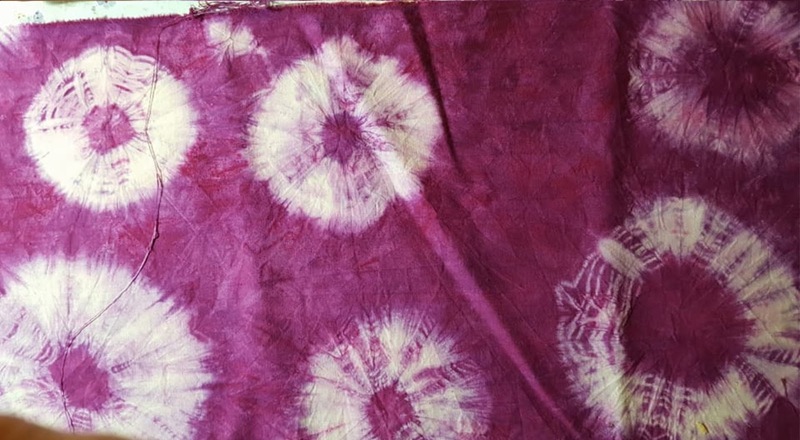 This week we attempted four different styles of Shibori dyeing. Arashi, Nui, Itajime and Miura. Each style has its own unique effect and can be used as a design in it's own right or used as a background for embroidery or cut to piece together as in a patchwork quilt. 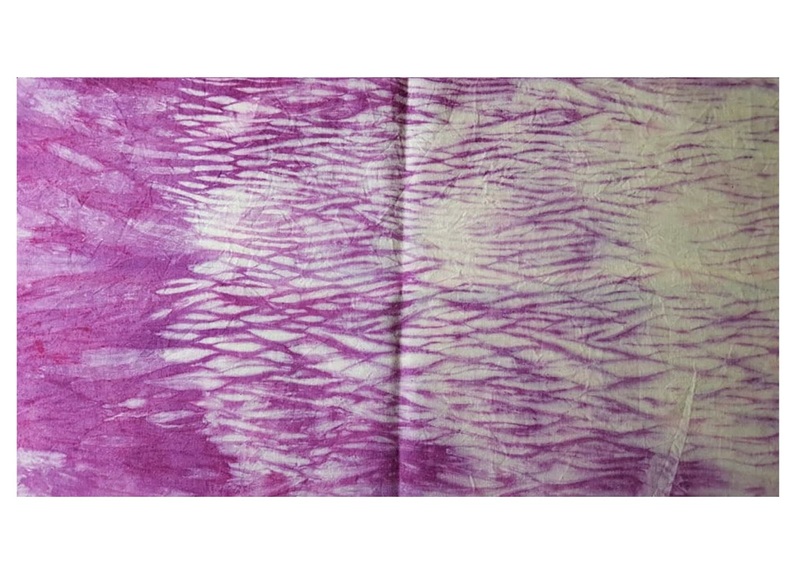 There is a beautiful book available called Stitched Shibori by Jane Callender, which is now in my basket on Amazon waiting for me to push that purchase button. My attempt was a little feeble this week but then I didn't have a great deal of time in class to stitch a master piece and as I say to the girls I am not an expert in every field of craft there is, I would love to be but that is impossible and probably very pretentious. To demonstrate this beautiful craft I very roughly stitched a spiral with a crochet cotton and pulled it up to gather the stitches, this helps form a resist where the dye cannot always reach creating a paler colour or staying it's original colour if the resist is tight enough. A little disappointing but still a pleasing effect, check out the book it's mind blowing! I just wish there were 48 hours in a day so I can just experiment and experiment! We had a few titters over this technique in class as it requires a plastic pole! can't see what's funny in that? any way I won't say more this is a serious class! The larger your pole (stop it !!!) and the more fabric you can wrap around it! Well the better really, but again in class we don't have the luxury of time and so a small piece had to suffice. Wrap your fabric around the pole squashing it down to form ridges rather like Nora Battey's tights or scrunch the fabric and then wrap any old way you can think of really and secure with string or rubber bands. Thanks to Linda! Using a brush add the dye, make sure it soaks in well and truly or like mine the first bit you wrapped won't have much colour. My artistic brain now is telling me to wrap it from the other side now and over dye it hmmmm might be a plan! This type of tye dyeing is probably the one that people mostly recognise. It was very popular in the 60's and 70's, probably because it's simple and easy to do. Pull the fabric into peaks and wrap with thread or rubber bands. Small ones, larges ones, thick thread or thin thread and then soaked in dye for a few hours Voila pretty spider web designs or large flower heads. 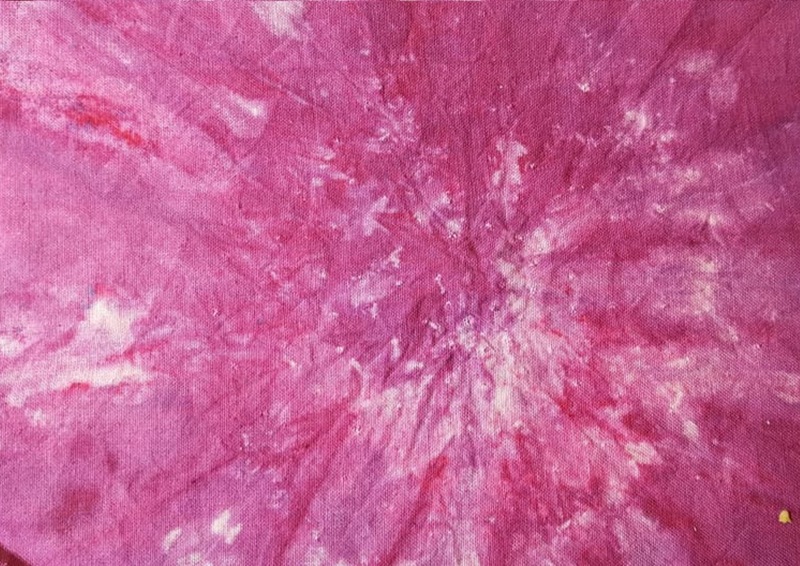 I tie dyed a whole outfit like this in school, and I loved it. This is a shape resist technique, I'm afraid I cheated slightly with my sample and just folded the fabric into triangles. Technically the fabric is folded and sandwiched between two pieces of wood and clamped together or bound. But you can use plastic shapes, jam jar lids or old cd's. I like the way mine turned out, but with further experimentation I think you could get some very dramatic patterns. Throughout I have also used one colour and traditionally it should be indigo but I have used a purple just to be different. You could also use multicolour too or over dye the possibilities are endless. Any one of the above techniques would certainly suit all types of stitching projects. In the next month the class is going to be concentrating on machine embroidery. We are going to be exploring quilting with and without the feed dog in use. Using the machine to draw with and also some water soluble fabric work too! I hope that we will be using these dyed pieces as inspiration for our work. Here are some of the samples from last weeks cram jar dyeing session Plenty of inspiration here!! Absolutely Stunning I'm sure you will agree, so I'm hoping they have got the bug and dyeing fabrics isn't as difficult as it seems. You may have blue or purple hands for a week but who cares when your creating amazing works of art in the meantime. Hope you got to have a go at snow dyeing and I also hope yours turned out better than mine! a complete washout literally when I washed it all the dye came out, not sure where I went wrong but I think it's because I used a poor quality calico that I didn't thoroughly pre wash and some old dyes which I thought I would use up. Never mind as we always say "we can always over dye it" nothing wasted!!!! Take care until next week and make some time to stitch the washing up can wait!